“One in a Million Contest”: Mea Culpa – “Shanghai Noon” could grab the win!!! As well designed for the “One in a million” contest, I would like to showcase the second design Tatanka Kaligawa made for this challenge. This gown comes with all parts you can see. The hair and shows are part of the outfit and even the amazing jewelry. What I was not able to show on the pics, the gemstones of the jewelry have a very tricky and great texture. It is glittering and glimmering kinda like an animated texture! I rarely saw such before and it really caught my attention. The same texture is repeated on the little balls that are attached on the shoulders. Such a shame that you cannot catch that in a picture but if you make your way to the Mea Culpa Mainstore and get this fabulous gown you can see it 😉 as well you can IM me and I will come to the store and show you :). The name already tells some about the idea that was behind that gown – it has a huge asia touch ;). The wonderful fan with the spikes on the right hip and the wonderful flowers that remind on orchids… simply amazing! The gown can be worn in 3 different versions. I tried to catch all possibilities with keeping one pose to show you what the changes are. Above you can see the first version. For this one you just wear the skirt layer and a special provided leggings under it. Second possibility would be the so-called mermaid version. For that you just add the prims on the bottom of the skirt combined with the stomach attached prim and the skirt layer. The last option would be a pants version. For that one you will find an extra made pants layer in your folder that is lightly different to the leggings for the skirt. The incredible hip attachment with the long trains for left and right go well with all versions of them but for sure you can experiment with it as you please. The wonderful shoes are as well part of that outfit as I said and they come with the Mea Culpa HUD to match your skintone perfectly. This outfit really is something special with all the possibilities to wear and all the additions you will get if you purchase that outfit! 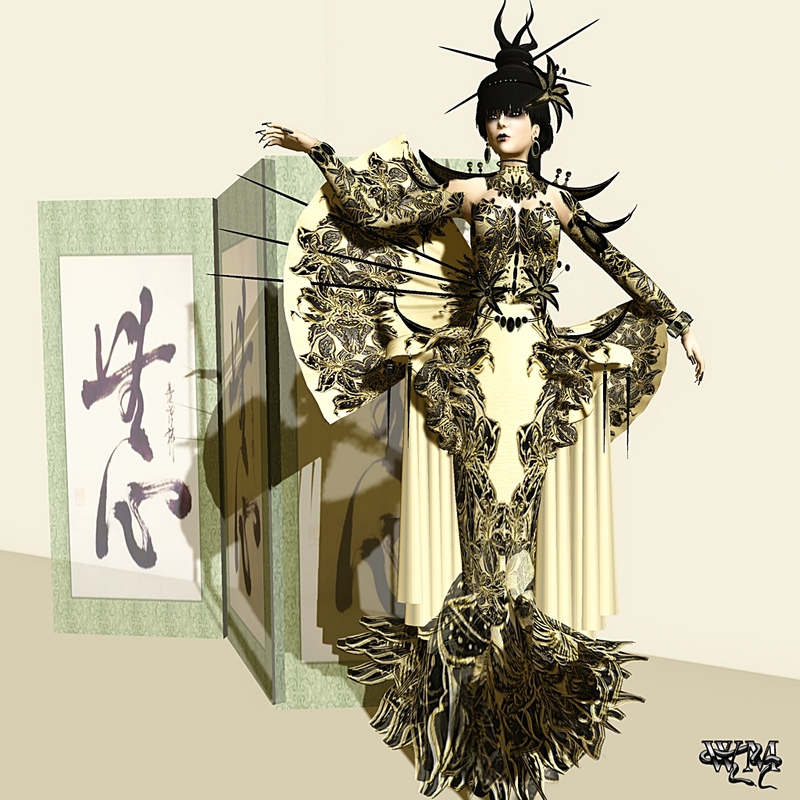 Ezura Xue – Future Fashion!!! One of Ezura‘s September releases was the “Genetic Digital Lady” outfit, here in black. 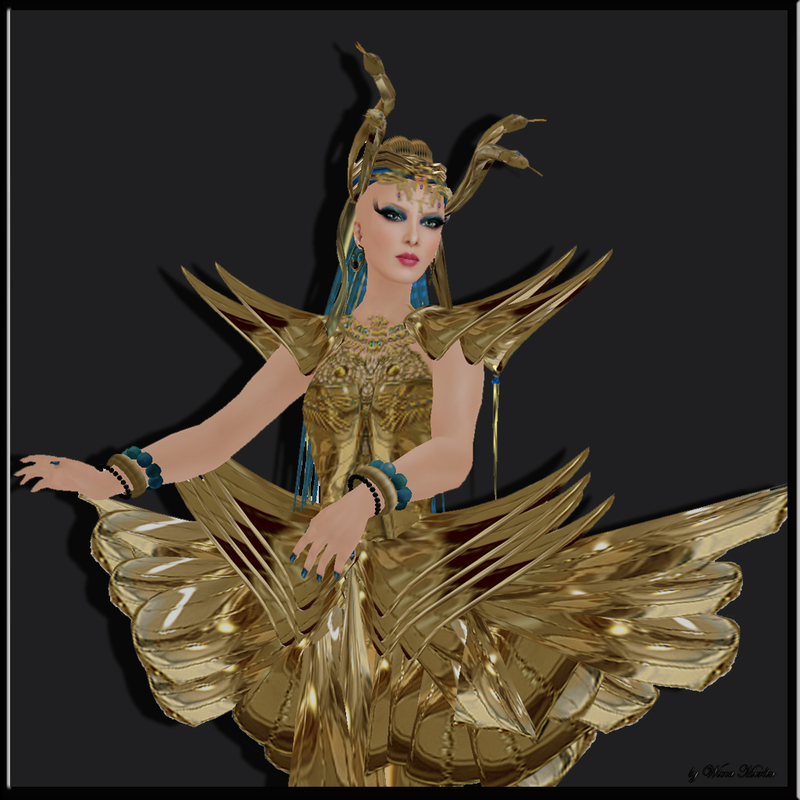 This wonderful outfit comes with so many cool details and possibilities… awesome! You can wear the “Genetic Digital Lady” as a dress. An awesome long skirt that shines like vinyl makes a wonderful floating look. The neck has a very deep neckline and is as well decorated with a futuristic accessory ;), a real cute eye catcher… A great idea is the HUD that let you change the color of certain parts of the outfit. Usually I have pink but for this look it just matched :p. So all parts of the outfit you can see in pink now you can tint in every color you can imagine as the HUD has a full color field! As well you can wear the “Genetic Digital Lady” as pants version 🙂 The ankle boots as well are made by Ezura. “Avant Garde E.T.” Ezura Xue called this amazing and outstanding pair of shoes that really caught my eye, as I saw them in her store. The fantastic hair piece as well is part of the “Avant Garde E.T.” line that is available, as far as I know, in black, red and white. What could complete this incredible outfit better than the “Eccentric” set from Finesmith Design. A few ago Tatanka Kaligawa again created new objects of desire for us ladies… Shoes!!! 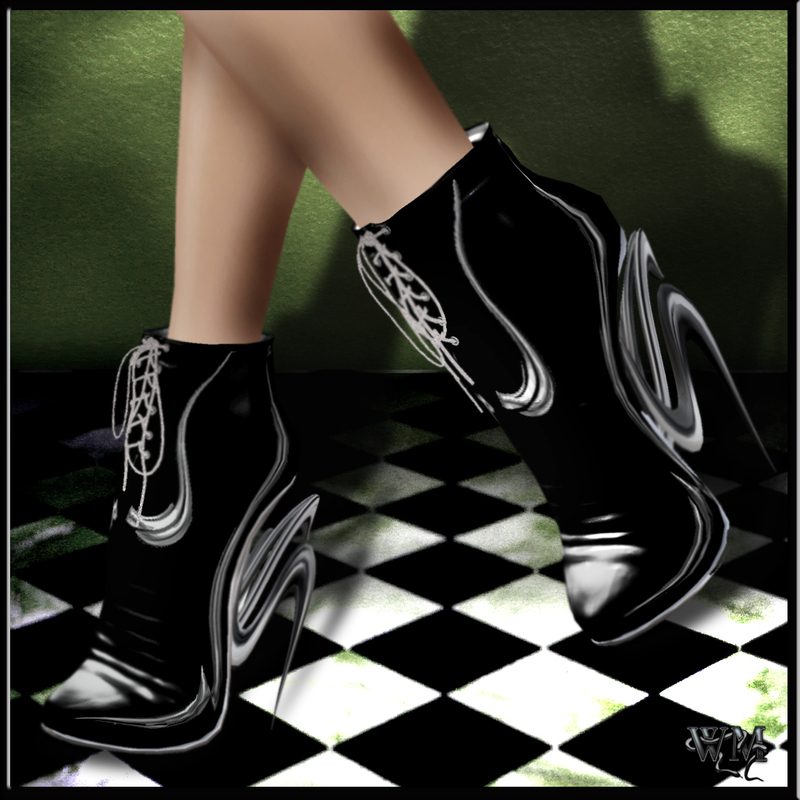 The “Bullet” shoes are the first of 8 new pairs of shoes out of Mea Culpas latest shoe release. The delicate fabric decorated with this amazing rings are perfect to wear for any style you want. 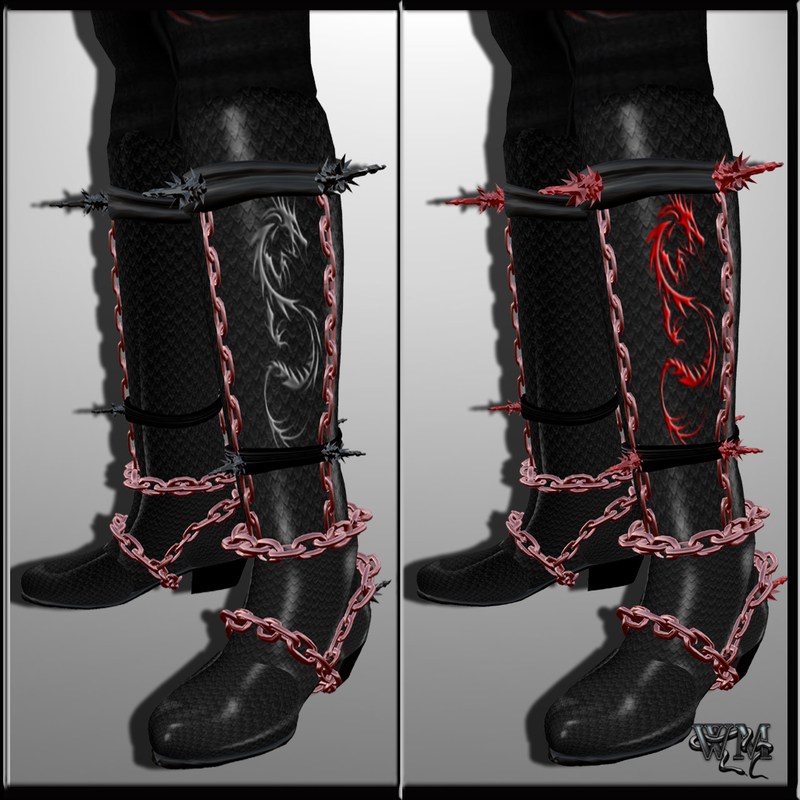 The heels are not just simple heels, again we can see the love for details, wich Tatanka always adds on his creations. As always you can change the nail color to every color you can think of with the great HUD that always is included if you buy Mea Culpa shoes. “Burlesque” is one of the 2 pairs that shoes no toes and is closed in the front. Never the less you have a possibility to use the great HUD to change the color of the little filigree flowers on the outside of the shoes. The “Empire” design for me has a very playful touch with the neat ruffles at the top and the bottom part of the shoes. The wooden sole and the metal rings make a great addition and give this pair or shoes a very special touch. Our next object of desire is called “Poison”. Very special for me on this creation is the light glow that goes over the shoes. You nearly get the imagination of a wonderful crystal decoration. The sole and heel are made of a metallic looking fabric. With all this amazing details and the special fabric, they are a little piece of art. “Quasar” is one of my personal favourites with the cool fabric that looks kinda vinyl and the huge spikes. 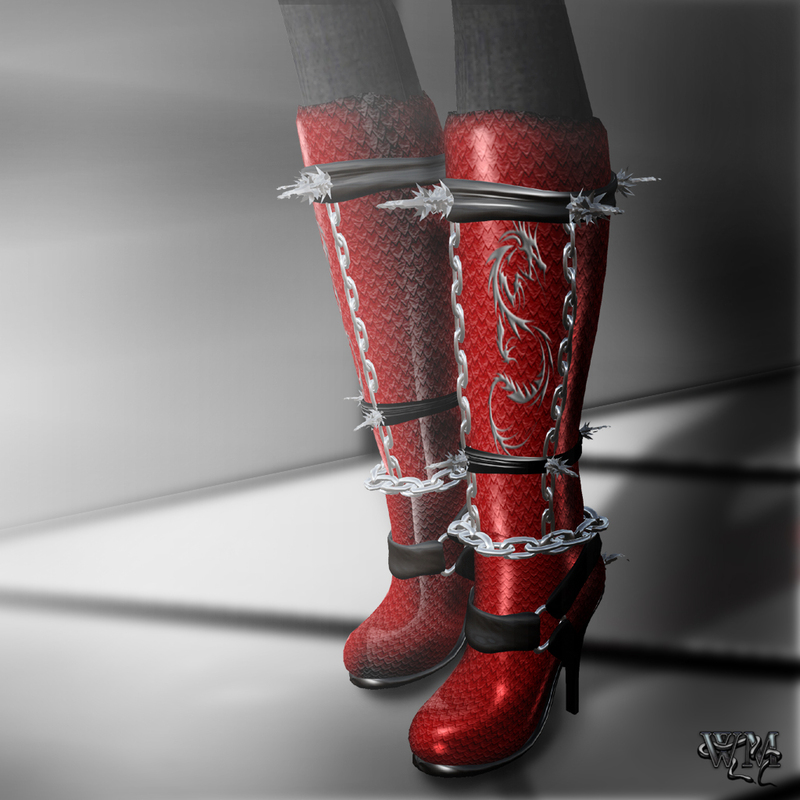 A really cool pair of shoes that really should not miss in a fashionistas shoe cupboard 😉 it as well comes with the great HUD that Mea Culpa always provides for their shoes. The “Speed” design all the steel and chains really make this style interesting. A few color parts that you can change in color with the HUD make it possible to match this pair of shoes to every kind of outfit. Last but not least I have my total personal favourite pair of shoes out of the 3rd Mea Culpa Shoe Mania… “Trex” have a real interesting fabric the reminds me of reptile skin. The ankle parts and the big spike in the back totally catched my eyes and I fell in love with that pair of shoes. Again of you take a closer look at the heals you can see the love for the detail that Mea Culpa shows off in almost all creations. The 3 steel lines make an awesome match to the whole style. First design are the “Dragon Boots” for us ladies 😉 This amazing sculpted boots are the highlight for every outfit. Every part is very well-shaped in every little prim and all that lovely details show off the skills and the eye for the detail of designer Redclaw Inshan. I was really impressed as I realized all the options that you get with this pair of boots… first, with the boots comes a HUD that let you change the colors for most of the prim parts to every color you can thing off as it works over a big colorfield that makes really every color possible. 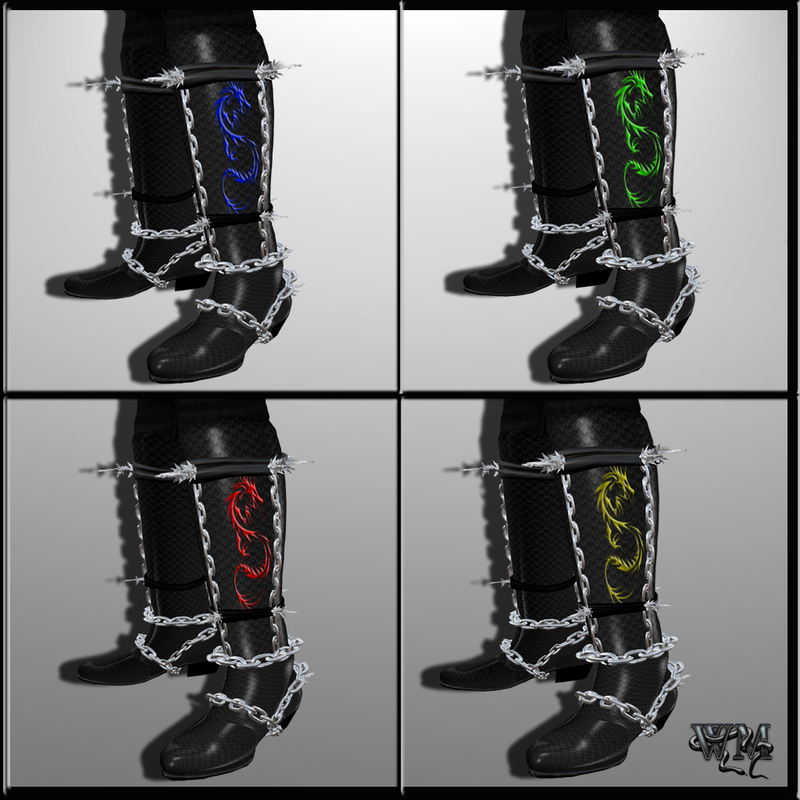 That’s not all.. also the basic color of the boots can be changed always to 5 brilliant colors so it will be always matching anyways what you wear 😉 The 5 basic colors are black, red, blue, green and purple and I will show all of them in this post ;). But lets take a closer look at the possibilities for changing the colors of the primparts… if you take a look at the picture above you can see that I shot 2 times the black basic with different colored accessories. On the left I changed spikes and chains to gold. So the great golden chains frame that awesome silver dragon that ornaments the outsides of the boots. On the right picture I kept the golden chains and changed the spikes only to a dark grey what gets the same awesome metal touch still. 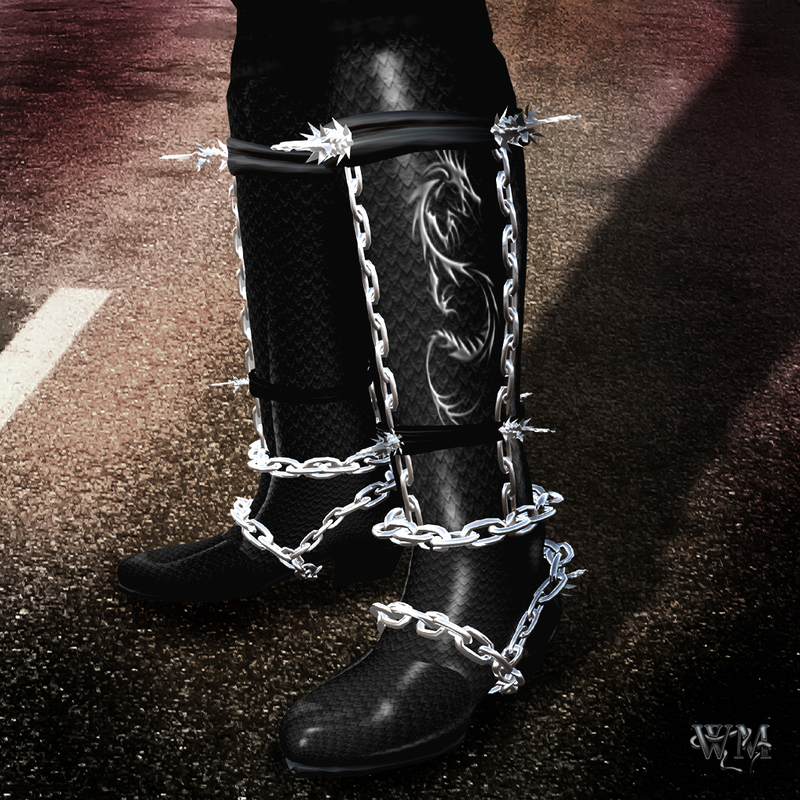 The basic fabric for this version of the boots is a plain leather one with amazing lights and shadows that bring out the dragon perfectly. There we have already the other 3 colors beside red and black – green, purple and blue. This time the basic is not just a plain leather one it looks like a very well done dragonscale texture. For the accessories parts you also have that HUD that let you change the chains and spikes to each and every color. There is only one light difference for the male version… the basic color keeps black…BUT the dragons change color! You can choose between 5 preset colors – silver, green, blue, red and gold! 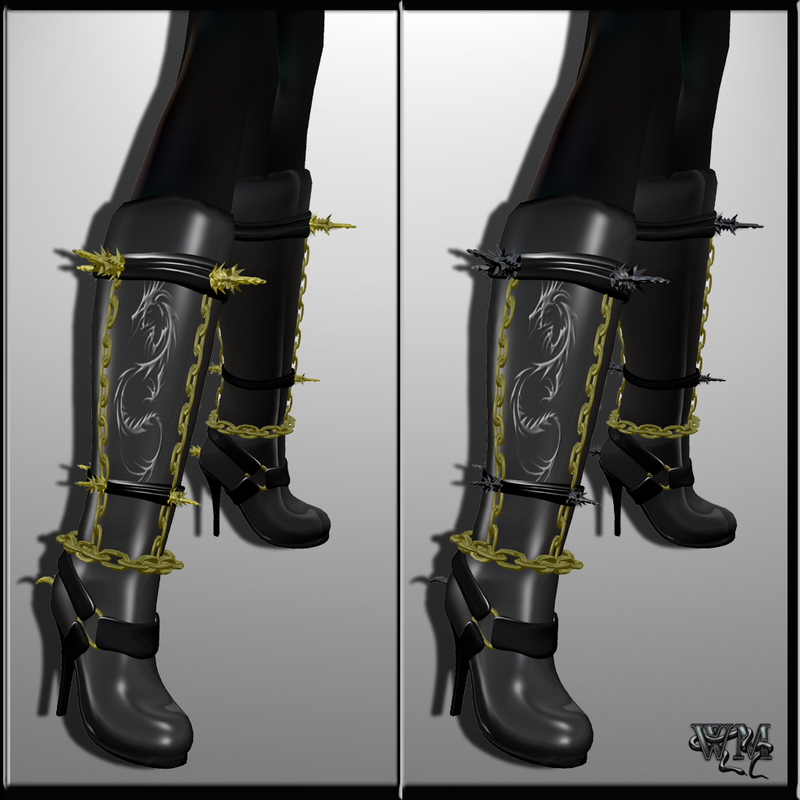 If you take a closer look you also can see the realistic side of the shoes… at the inside of the boots there are no spikes at all as it would be really painful *grins* Even that detail was taken care of for males and females. 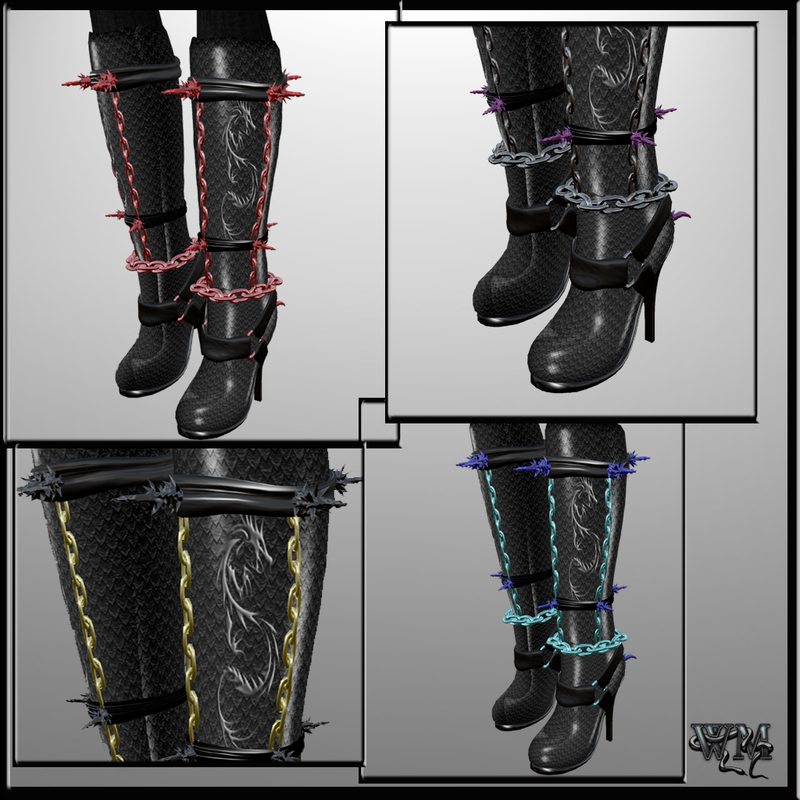 So guys now you cannot complain anymore about not having stylish and extravagant boots 😉 With the “Spiked Dragon” boots you are definitely up to date! Again we have a plain leather version as a great basic in the 5 preset colors black, red, purple, green and blue. 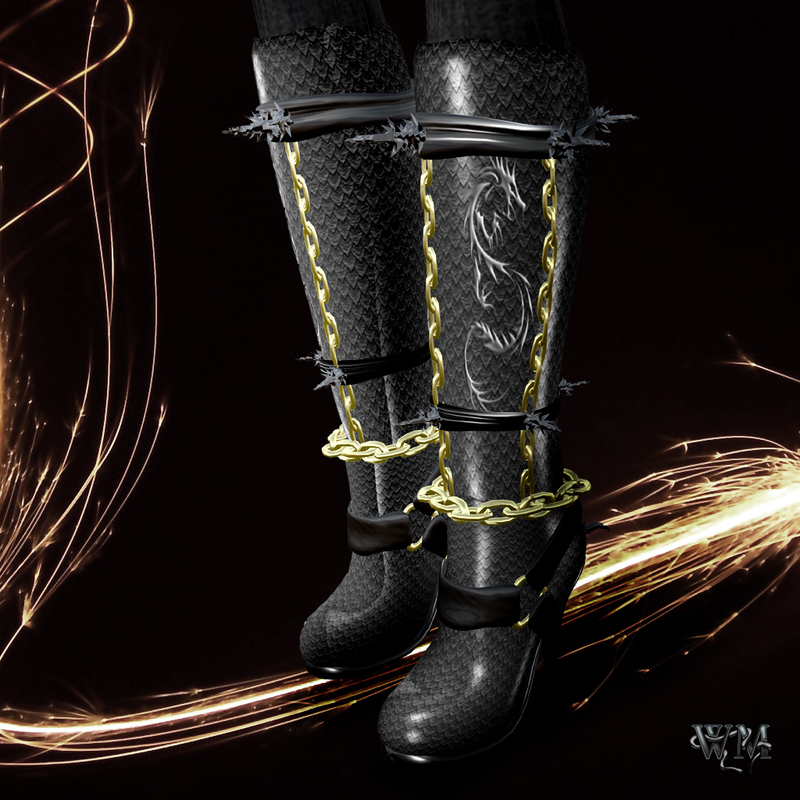 As we have it for the female “Dragon Boots” you can change the color with the HUD for the prim accessories and even for the eyes of the snake. This boots as you can guess by the name have an amazing cobra that decorated the outsides of the lower legs. Again… it is amazing how very well every little detail is done.. for example take a closer look at the snake head.. you can change the color of the eyes as I mentioned and also you can see the sharp poison fangs very clear.. simply awesome! 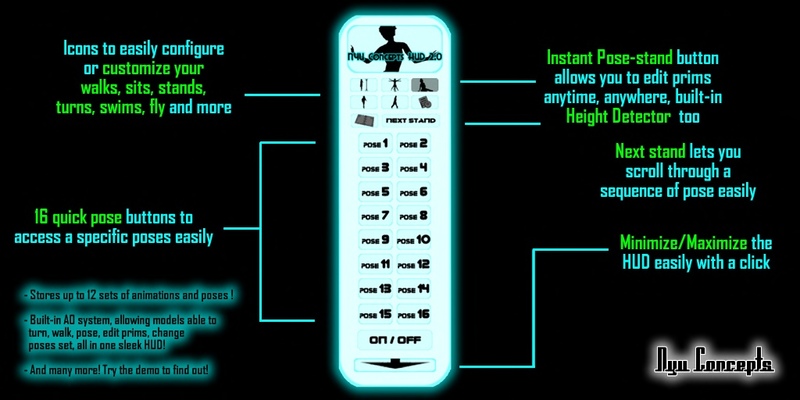 And all boots can be resized via the HUD too that is delivered to every pair of boots! Golden News from Mea Culpa – Return of the Isis! “Return of the Isis” is the name of Tatanka Kaligawas latest release. A fabulous golden outfit that honors its name. For sure it is to notice that the old egypts inspired to that dress in colors and some little details 😉 The gold and turquoise are typical colors for that, also the symbols on the top of the dress, also on the forehead from the great head-piece. The shoulder carry the amazing shoulder prim parts with nice spiky “icicles” in the back. The skirt part is the dominant part of this outfit. The hugs prims give a very stylish and modern touch. Also the golden and turquoise hair is part of that outfit. 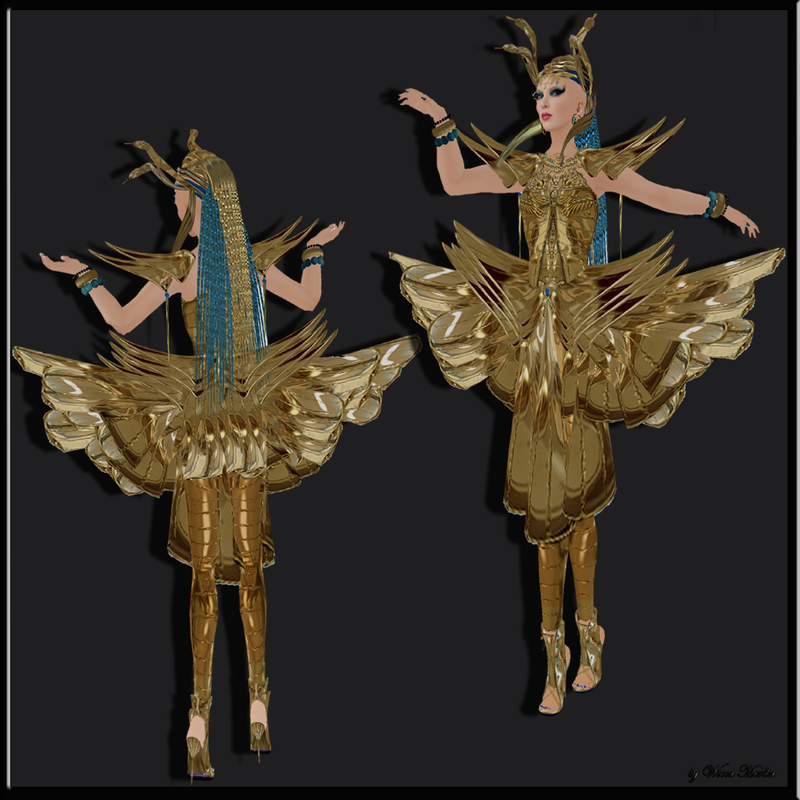 The shine of this textures and the flexibility of some of the prims are make the whole outfit to a totally must have if you like the extraordinary clothing! To solve the shoe problem what is always a huge one if it comes to the golden color Mea Culpa saved us all ladies! Matching shoes in the right gold tone! The shoes come as always for Mea Culpa shoes with a HUD that let you change colors of nearly parts and match the skin tone of the feet to your own one. 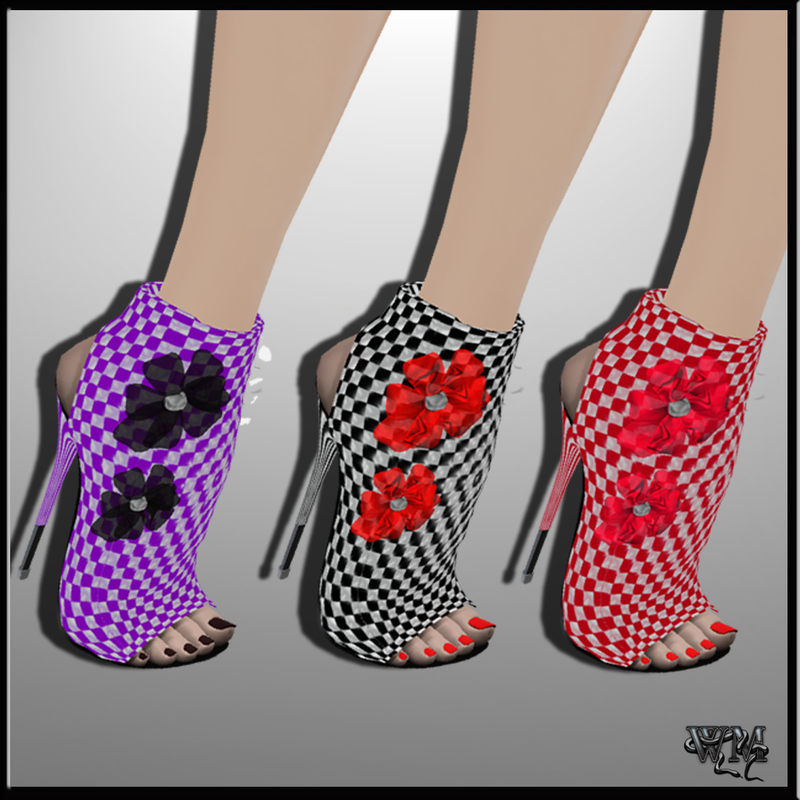 If you wanna see all the other great designs of Mea Culpa, make your way to the Mainstore where he has all his great creations and also the new shoe line!